Alan Meloy, a semi-retired information technology worker from Yorkshire, took pictures of Donald Trump's plane passing over north England. The trip to Iraq was Trump's first one to a combat zone. A British aviation enthusiast was credited Friday with breaking the news of US President Donald Trump's secret visit to Iraq over Christmas after snapping photos of his plane over northern England. He shared the images on his Flickr account, correctly identifying the plane as a VC-25 -- one of two highly customised Boeing 747 jumbo jets used as Air Force One. "It's one of those weird moments when you're right place and right time," Meloy, who lives in the suburbs of the industrial city of Sheffield, told The Guardian newspaper. "If you want to do covert work use a covert plane," he said. On his Flickr account, Meloy said: "The internet had worked it out several hours before the White House formally confirmed the visit was taking place". 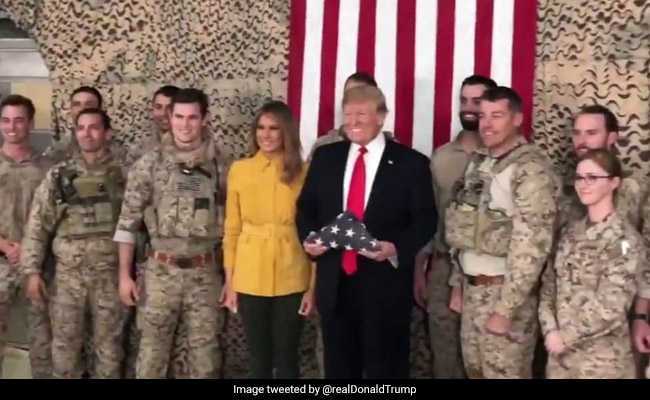 During the trip, Trump's first to a combat zone, the US president said the security precautions were unlike anything he had previously experienced. "If you would have seen what we had to go through in the darkened plane with all windows closed, with no light anywhere -- pitch black," he said. Meloy added: "Fortunately for us Yorkshire inhabitants he was travelling with the curtains shut and lights out so won't have noticed us looking up at him".